Older Island homes rely on septic tanks for their sewerage treatment and disposal. As long as these units are properly maintained and their disposal fields protected they should give many years of trouble free service. Property owners are required to have their tanks pumped out at least every three years by part 29 of the Auckland City Council Bylaw 1998. If these tanks are not pumped out on a regular basis, settled solids build up, and leave inadequate space in the tank for proper treatment and retention of incoming material. Odours result and in extreme cases the sludge solids can migrate into the drainage field causing field failure. All liquid wastes from the house are directed via the gully traps to a septic tank, which should be large enough to hold all wastewater produced from the household for at least 48 hours. During this period of time two things happen. Micro organisms living inside the tank digest the nutrients contained within the wastewater, breaking them down into simpler compounds. This digestive process produces gases, which float some of the lighter material to the surface of the tank, forming a scum. Settling of indigestible material forms a layer of sludge at the bottom of the tank. In between the sludge and the scum, water in the settling zone gradually becomes more purified and moves, after the 48 – 72 hours, on to the disposal field. Over time sludge and scum build up, and the settling zone becomes progressively smaller. 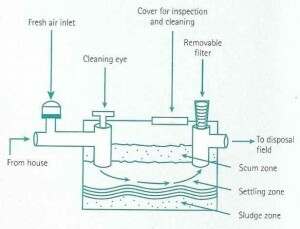 Sludge and scum must be removed on a periodic basis to ensure the continued working of the tank. Such removal should be an entire removal, and is facilitated by lifting the lid of the tank and vacuuming out the entire tank contents. This lid should be easily accessible and protect the tank from stormwater ingress. In older style systems that are deeply buried it may be necessary to bring access to ground level by the fitting of a concrete riser. More modern septic tanks have a removable filter by the outlet. The filter stops larger objects making their way into the disposal field and creates another site for digestion to take place, thus improving the quality of the water leaving the tank. This needs to be rinsed our every six months or so to removal accumulated biomass and prevent the system from blocking. Some septics have pumps or dosing syphons feeding the disposal field, others rely on gravity. There are many different systems available, each with their own design features. Generally there are three treatment stages, each in a separate chamber. The first stage is a settling stage, and operates much the same as a traditional septic tank. In the second stage some type of aeration occurs, aided by a pump or a stirrer, which encourages a more active type of micro organism that is more thorough in digesting the material in the wastewater. The final stage is another settling, where the remains of the micro organisms settle out. Then the treated wastewater is pumped to a disposal field, usually dripper lines. Not only do these systems require desludging every three years, but filters need to be cleaned and the dripper lines needs to be flushed, screens on pumps need to be cleaned and system operation checked every six months. 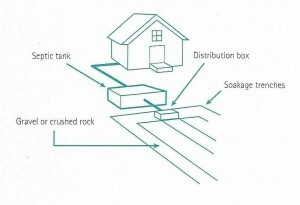 TRICKLE FED SOAKAGE TRENCHES Older systems usually soak through field tiles or perforated pipe laid out in trenches filled with gravel or rock. Flow is generally controlled between these trenches by a distribution box. Weirs are also used in some older systems. BORES Deep bore holes were popular in the 80’s and 90’s, but are no longer permitted, due to the possibility of contamination of ground water. These go down 6m, and the treated wastewater passes through perforated pipe into a gravel or rock filled bore. LOW PRESSURE EVEN DISTRIBTION Alkathene pipes inside perforated pipe carry treated wastewater along shallow lines through topsoil for surface plants to take up. DRIP IRRIGATION SYSTEMS Treated wastewater is released on the surface, or just below the surface of the ground drip by drip, in a controlled way, for plant uptake. There is a list of plants recommended for LPED and DIS fields, which is available on request. Install water saving devices, practice water conservation. Wait for a full load before using the washing machine, and try to stagger your washing through the week rather than doing it all on the same day.